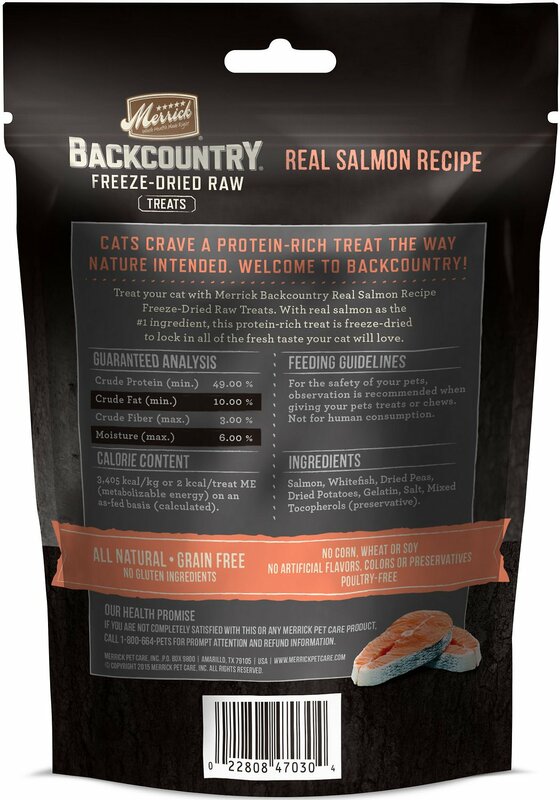 Treat your kitty’s inner wildcat with the Merrick Backcountry Grain-Free Real Salmon Recipe Freeze-Dried Raw Cat Treats. Formulated to satisfy your pal’s hankering for meat, these raw treats are made with freeze-dried salmon as the first ingredient to satisfy your little carnivore’s cravings. Since they’re freeze-dried, all the flavor your pal loves is locked into every delectable bite, with zero grains, gluten, by-products or anything artificial. Give them out of the bag or throw them to get your pal chasing after them. Oh, the delicious thrill of the hunt! Freeze-dried raw treats are made with salmon as the first ingredient for the fresh-catch flavor and protein your pal craves. The freeze-drying process locks in the fresh flavor your pal loves and preserves the natural proteins and nutrients in every bite. Perfectly-shaped for anytime snacking and treating for cats of all ages, and can be tossed for added play and exercise. 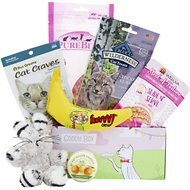 Can be part of a healthy diet at only 2 calories per treat, with no poultry protein sources for kitties with sensitivities. Made in the USA with zero poultry, grains, gluten, artificial flavors, colors, or preservatives and comes in a resealable package. Treat Responsibility: Merrick Backcountry Real Recipe Salmon Treats are intended for supplemental feeding as part of an overall well - balanced diet & exercise plan. Choose treats as recommended based on the seize of your cat. for the safety of your pets, observation is recommended when giving your pet treats or chews. Keep fresh water available at all times. 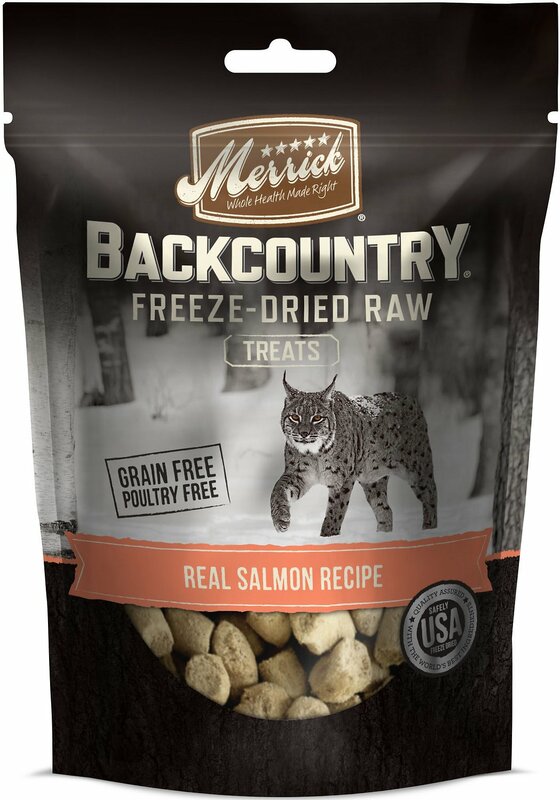 Merrick Backcountry is an all-natural, grain-free ancestral feline diet packed with the protein cats crave. 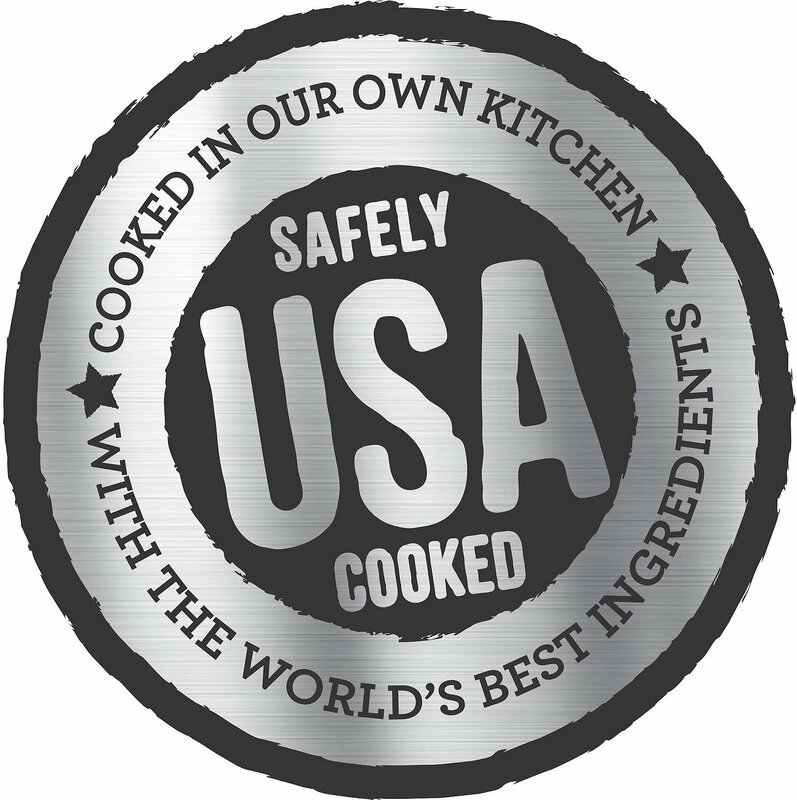 All recipes are cooked in the USA in Merrick’s own organically certifies kitchens. 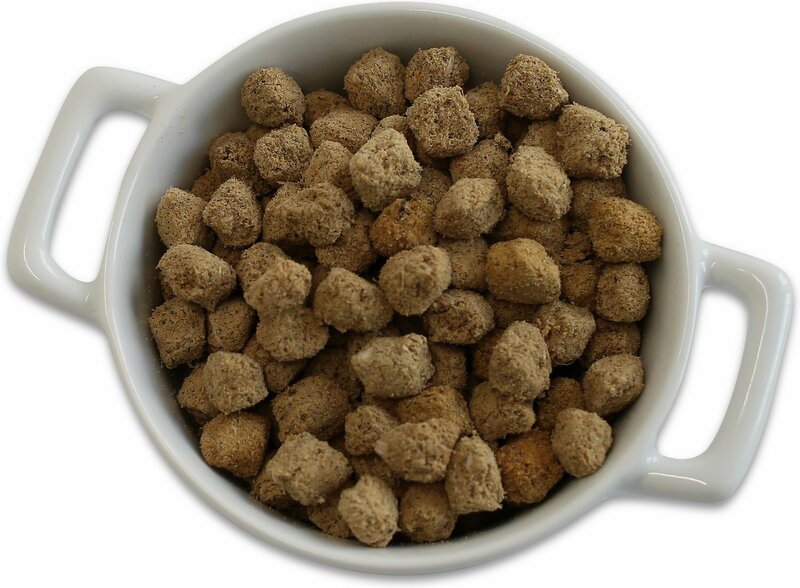 These raw-infused kibble recipes deliver a perfect combination of grain-free kibble plus whole, raw pieces of freeze-dried meat, offering the nutritional benefits of a raw diet in a convenient format. It's the perfect balance for health-conscious pet parents who love the convenience of freeze-dried foods and the value of premium kibble. Merrick Backcountry's grain-free stews and protein-packed canned meals offer delicious variety from exotic protein blends like rabbit, venison and salmon, plus fresh-cut vegetables all smothered in a hearty gravy. Cats just love digging into these succulent feasts, and pet parents love all the nutrition their kitties are getting. Merrick's all-natural Backcountry treats complement delicious Backcountry kibbles and stews. 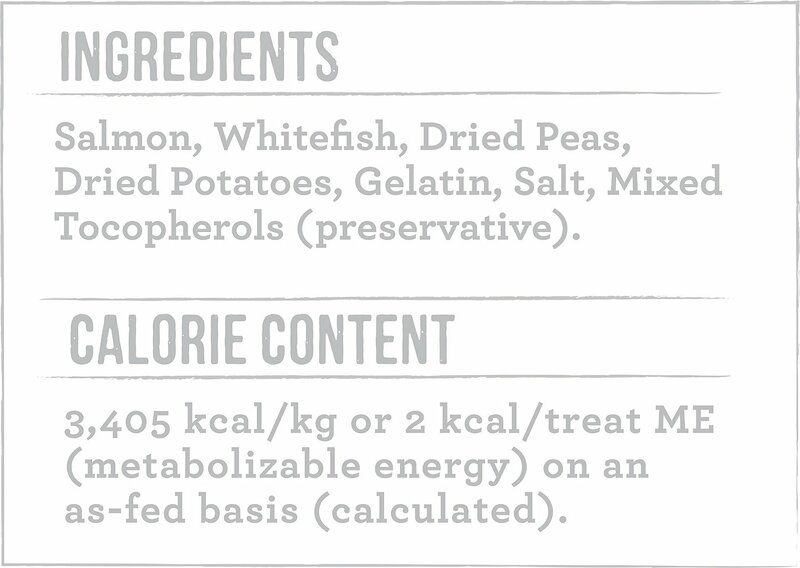 Each recipe features real, freeze-dried pieces of raw poultry or fish. 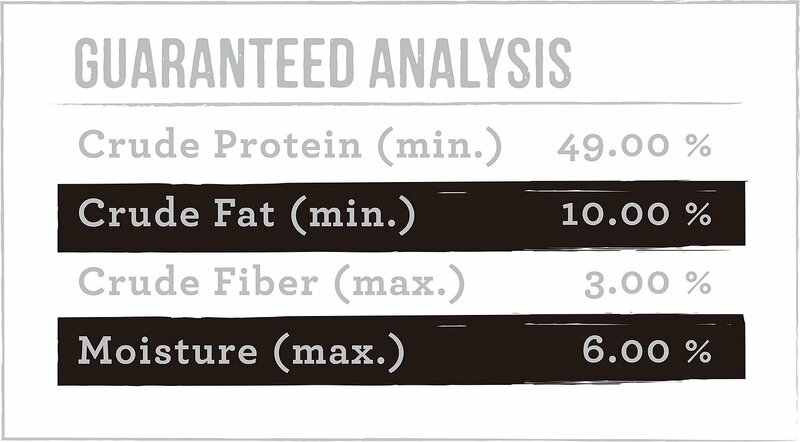 They're completely free of grain and gluten, and feature incredible flavor cats crave. Simply add water for extra moisture, or serve straight from the bag. Contains long-chain omega-3 fatty acids, plus EPA and DHA for overall health and well-being. My cat is pretty fussy. She will not even eat table food if offered a small bite. So that part of the review should not reflect on the product. However, part of the bag was in powder form and the chunks or treats are varies sizes some too large for most cats. They do have a strong salmon smell which you would think would be attractive to a cat. Not at all. Cheenya a picky kitty. She will eat any dog treat, but if its a cat treat, it better be great. She tore these up! She couldn't even do her typical one bite and I will pretend like I don't like it until you go away. She tore it up before it even hit her blanket, which is where I give her treats. Then, her motor started running, loudly. Even the dogs stopped to stare. Yes, these definitely passed inspection, with flying colors! I bought these as an experiment, but I think that I will have to make them a permanent addition now. My dog loves the treat. It’s a great addition to salmon dry food when you mix it. I add a few threats of this raw salmon to his dry food. My cat LOVED these and were huge for him. The last 2 bags of the treats and bag with these mixed in with the food, flopped. They were hard. They were so soft before. 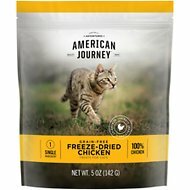 Chewy has been great in dealing with the issue, but just disappointed in the quality of the Merrick cat products with freeze dried raw. Another great product with ingredients I feel good about, and my super picky boys approve! I add a few on top of their meals, and they eat these first. Will certainly be buying these again! These smell stronger than any other freeze dried treats I've given him. It took him a while to decide to eat it. Luckily he like it! My kittens are fed only raw so these are a staple! Huge hit in this house, and I like that the pieces are smaller so my little kitten can enjoy too! The first treat that all 7 cats loved!! They have a strong smell which my kitties loved! I am very disappointed. My cats will not eat the treat. It may just be my picky cats, but . . .
No smell and used as a toy?